Films are the ultimate way to escape reality, but sometimes when you sit down and think, you’re grateful your workplace is not at one of these film fictional settings. From Dino-Zoos to Candy wonders here’s a short list of films that would never pass OSHA standards. Immense lack of supervision, safety protocol, and keeping doors shut. Whoever worked at the factory at the end of Terminator should be…well…terminated. Let’s look at the final scene of Sarah and Reese fighting Body-Built Arnold’s endoskeleton for a few examples. They break into a factory without any alarms or a security guard to tell them off. Reese decides to turn on all the buttons. So that they can’t be tracked by the ultra-advanced killing machine. Brilliant, right? Except it still finds them, with its eyes. Like a normal person. Leaving him and Sarah in a deathtrap maze. Luckily, Sarah kills Arnold T-800 at the end by using a hydraulic press. Even though it should have been LOTO’d, and inoperable as required by OSHA standards. Kick forward to the sequel and we find ourselves again at a factory unstaffed or supervised. But this round, everything is in high operational order and running. Sparks are flying everywhere way more than usual. And there’s an active molten pool of metal, with not a single SST certified welder in sight. Connor’s Mom and himself clamor up the stairs (with one side that has no guardrails). They get cornered, he’s sent off on a rigger line going god knows where (almost to his death), and the rest is a direct result of no overnight security and whoever left all that equipment active and not following OSHA’s LOTO requirements. Or whoever took a massive lunch break. As far as their career’s future stood, they won’t be back. You’d think a facility that has discovered a way to bring back dinosaurs wouldn’t leave basic OSHA codes in past. You’d be wrong. Remember how in the original (sorry Chris Pratt), it was a stated fact that the park was not ready for the public? And billionaire John Hammond, didn’t care and opened it anyway? Well, OSHA would have and fined him big time for his ridiculous electrical fence. And his doors. For one, the entire park is gated by a massive electrical fence. Meaning that the entire ‘safety’ of the park is one power outage away from being useless. Which happens to kick off the plot of the film. So…yeah the Jurassic Park fence is not up to OSHA standard. We dino what to tell ya. Ok, so maybe a borderline unkillable murderous extraterrestrial lifeform seems like it’s a much more concerning matter than OSHA standards, but if certain procedures were put into place, maybe the crews that encounter the Xenomorph would have fared better. In most of the films, the crew was understaffed, had few provisions, and little to no supplies provided to them to the point that from the beginning they almost would have died from starvation or the high chance of food poisoning. Specifically, in the film Aliens, the LV-426 ship only has thigh-high handrails for walkways which are prime for fall accidents and resulted in an off-screen death. Even worse is if you consider that those sets are actually in the Acton Lane Power Station in the UK. That’s not a prop, that’s a legitimate factory full of real-life work hazards. Thank goodness it was closed right before filming, right? 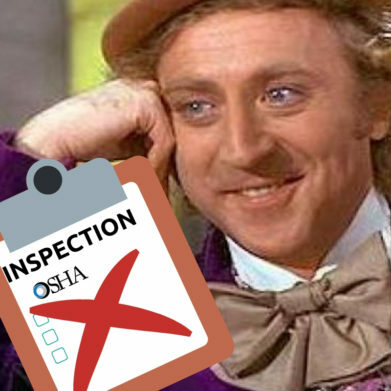 There’s nothing sweet about the disregard of employee and child safety in Willy Wonka’s Factory of OSHA’s worst nightmares. The sheer amount of violations, if applied to a real factory that held and conducted the same procedures at Willy Wonka’s Chocolate Factory, would have been enough to close the business. Let’s look at one set of violations for example, shall we? From the lack of banisters on the stairs leading to the chocolate river room, food running in open air ie. the chocolate river, no guardrails (we’re having a pattern here) to stop kids from falling into said river like Augustus, no immediate stopping of the river upon said falling for both the child’s safety or the health hazard of a young child’s body in essentially a vat that makes candy bars in masse. A side note: an actual chocolate making vat requires constant churning from the vat’s agitator. An agitator is a metal paddle that turns very quickly on the inside to make sure that the chocolate, kept at a constant temperature of roughly 110 degrees, doesn’t settle. People can barely swim in a vat of chocolate if they fall into it. And most who have died from the experience either due to the heat or being crushed by the various machinery that makes the sugary goods. The only saving grace from that entire scene is the fact that Augustus lived, but Wonka would still have a steeper price to pay beyond the boy’s medical expenses. At no point does Wonka tell the Oompa Loompas to stop production of the chocolate Augustus falls into. So…that means a percentage of the chocolate made at that moment has his germs. Ew. But, realistically, if due to all of those code violations, Augustus’s germs made a future customer sick, Willy would be liable for fines up to 1.5 million dollars per lawsuit from each person that came forward along with the OSHA fines and fines from the FDA. And just how much of a fine would OSHA give him? For every willful violation of OSHA standards (roughly 60 in this film alone) he would have had a bill of 1. 86 million in the time the film was created at the least and up to 26.1 million at the highest. And for us, that’s too hard of a gobstopper to swallow. Despite our concerns about these fictional settings in film, the upside is the fact that these are fictional worlds with fictional characters and as such, don’t have a risk of real lives (except for Willy Wonka during one scene. The entire cast was out of commission for a few days). But on the job, these minor oversights can and will cost more than a movie ticket. In real life, people don’t come back for the next ‘shoot’ after a good place Wilhelm scream. With compliance to OSHA standards and Site Safety Training certification, you can make sure you and your team don’t end up starring in the next 5-minute horror film.